Features 4 Office 2013 applications: Word, Excel®, PowerPoint® and OneNote® Improved user interface is optimized for a keyboard, pen or touch-screen display. Includes 7GB of online storage, allowing secure access to your documents from anywhere. 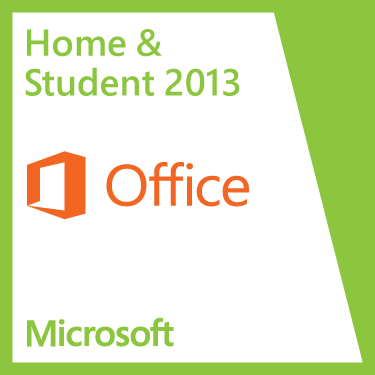 Word 2013 lets you create professional-quality documents. New feature lets you open and edit a PDF document, while the new Read Mode offers easier on-screen reading. Object Zoom allows easy zooming in on tables, charts and images. And templates and tools let you add polish and style to your documents. Excel 2013 offers powerful tools to work with data. Lets you explore, analyze and visualize data to gain new insights. The Quick Analysis tool helps you choose the best chart or graph to visualize your data, then format it in a single click. Time-saving templates let you focus more on your data. Pivot tables let you summarize complex data with ease, now with extra help. PowerPoint 2013 lets you easily create effective, impressive presentations. New to 2013 is touch-screen support, great for use on tablets and phones, that lets you swipe and tap to advance through presentations. Features such as Presenter View and Slide Zoom help you deliver your presentations more smoothly and flexibly. And a wide variety of themes and variations, along with merging and alignment tools, make it easy to create great-looking presentations quickly. For business or household use. For use on 1 computer. Purchase is for the life of your PC, and license is non-transferrable.